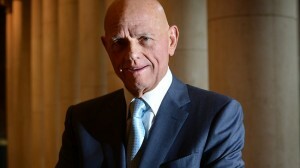 Another big money divorce in Melbourne, Australia between billionaire Solomon Lew and wife Rosie Lew. Solomon Lew has been seen with a pretty blonde of Greek heritage many decades his junior who has been by his side since he ended his 45-year-marriage to Rosie. The 40-something, Melbourne single mother of two is Rosa Prappas. Solomon Lew, 69, separated from his wife last February. Friends of the couple say Rosie Lew is keeping a “dignified” silence on the matter, although privately she is said to be “extremely bitter” about the end of the marriage. Rumours have been rife that Rosie Lew will walk away from the marriage with a settlement worth about $300 million. Rosa Prappas is the woman who has been living in Lew’s multi-million dollar penthouse apartment in downtown Melbourne. She will be joining the retailing mogul in the first week of August as they join 80 other guests heading off to Mykonos for the combined birthday celebrations of Lew’s right hand man Mark McInnes and his partner Lisa Kelly. Although Lew is enjoying the good life for now, his imminent divorce is part of a broader family collapse over recent years that could at one point unravel the secrecy and control Lew has held over his massive fortune for decades. Solomon Lew’s daughter Jacqueline had been embroiled in a bitter matrimonial dispute with her former husband Adam Priester, while his son Steven Lew was involved in divorce proceedings with his estranged wife Sarah Nowoweiski. Both cases were before the Family Court, which bans any media coverage. But the private feuds had spilled into the public domain in dramatic style. Lew’s 2012 writ in the Supreme Court of Victoria was a pre-emptive strike to protect part of his family’s $621 million Lew Custodian Trust from Priester and Nowoweiski, who are parents to six of his grandchildren. The case could have serious implications for Lew. Aside from the vast fortune at stake, Priester and Nowoweiski have been the custodians of business and family secrets that could be exposed in court. The dispute centred on a longstanding agreement between Lew and his three children, Peter, Jacqueline and Stephen, who each received $170 million but agreed to cede control to their parents. While the deal is believed to have never been documented, each child would receive $25 million in loan accounts in their own names, with the remaining $145 million to be gifted back to Lew and his wife Rose. According to Lew’s senior counsel, Leslie Glick, the arrangement was designed to minimise tax, at a time when the former Howard government was contemplating a tax on the undistributed reserves from family trusts in 1999. The tax never happened, but the deal remained in place, and only became an issue when the marriages of Jacqueline and Stephen unravelled.